On a recent evening out with a few friends, I found myself at Sabatini’s Pizza in Exeter, about ten minutes from Wilkes-Barre. We were there primarily for fellowship and discussion, with food and drink as an afterthought. So I was shocked when presented with the list of beers, which I quickly recognized as the best I’ve found in Northeastern Pennsylvania. What was most surprising and exciting to me was seeing about ten beers from the budding Italian craft beer scene. In New York and Philadelphia, I’ve occasionally come across some of these beers, but never such a significant number. Of course, Italy is wine country. Until very recently, beer in Italy has always occupied a lesser and subordinate role. Beer might be something one enjoys with pizza and other casual fare, though it’s hardly been worthy of serious study or reflection. But in the past fifteen years that’s all changed. Micro-breweries are popping up throughout Italy (though mostly in the North at this point), inspired by their European and (yes) American counterparts! Not satisfied to simply imitate more traditional styles, Italians are pursuing the art of brewing with their own distinct character, producing both traditional beers and beers pushing into new frontiers. Many are idiosyncratic to be sure, though nearly all have character. At our recent visit to Sabatini’s I enjoyed two very different Italian bottlings. The first was a remarkable sour red ale produced by Panil in Emilia-Romagna. This style of beer is in many ways more reminiscent of wine, and can be a helpful bridge for wine drinkers into the world of beer. Fermented in wood for up to eighteen months, these beers develop sourness from their development of lactic and acetic acid. The folks at Panil claim that their bottling is the only fully natural and traditional example of this venerable but rare style. 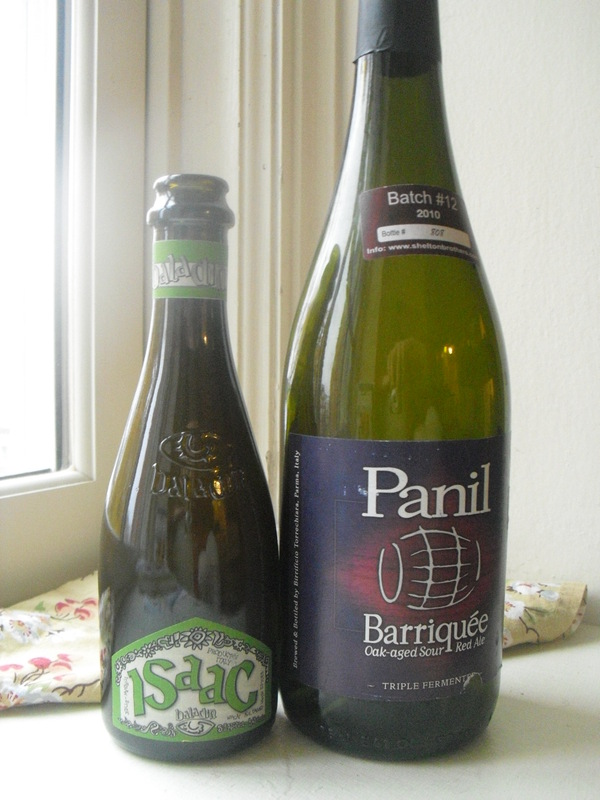 Panil Barriquee comes only in 750ml bottles, so bring a friend! The second beer comes from one of Italy’s most important leaders in the craft beer movement, Baladin, located in a small town in Piemonte. Baladin also has a restaurant in Rome (Open Baladin) serving an amazing variety of Italian and international craft beers. Unfortunately, they try their hand at American pub food, which is significantly less successful. The Baladin beer I sampled at Sabatini’s was Isaac, a witbier distinguished by its potent, refreshing aroma and evocation of citrus and chamomile, a distinctly Italian interpretation of a traditional and widely popular style. The pizza at Sabatini’s is also enjoyable and distinctive. It is certainly American and not Italian in its approach, but within that context it is unique and has personality. The family business was founded in 1958 and is currently operated by Lindo Sabatini, grandson of the founder. It is Lindo’s passion and commitment to quality which drives the excellent beer offerings, and I’m deeply grateful he’s put such beautiful beers from Italy within such easy reach! For those interested in sampling a number of these beers, Sabatini’s is offering a pizza/Italian beer tasting this Wednesday, November 16. For an even larger selection of Italian beers, one can go to Eataly in NYC, either to the market on the lower level or up to the new rooftop brewery/brewpub, which is a joint venture of American brewery Dogfish Head and Italian breweries Baladin and Del Borgo. My last experience of Eataly, when I was nearly trampled by the thronging mobs, has not encouraged me to return, though I’m sure that the rewards would be high for those who can brave the crowds. For a quieter reflection on Italian beers from the comfort of your own home, here is an excellent article. I’ve been wanting to go there! The beer list at the Arena in W-B is also amazing.Metro in Dallas is decent for beer, too. I personally love those sour wine-like beers, and will have to check them out. Cheers!